One of the items I received from Influenster in my Beauty Blogger VoxBox to review for you was the Black Pepper Bergamont Mini Fall candle from Bath & Body Work. I have really enjoyed this scent. It is very masculine, warm and spicy, much like an expensive cologne. It was a wonderfully non-distracting scent while I was reading. The size and price of the mini candles is great to buy for gifts or if you have scent commitment issues like I do. I honestly suffer from candle ADD and move on the next day. The scent isn’t very strong when you use it on a warmer and I found that disappointing because I am easily distracted and tend to fall asleep if I sit still for more than about twenty minutes. When lit, the fragrance was much more potent and filled my loft with the scent. These little candles are rated to last 10-15 hours, I found I got about 8 hours from mine. Overall, I would recommend and purchase again. She blogs when she’s bored…at least there’s no tequila involved. I’m not really sure why I’m blogging tonight. I think it is out of sheer boredom. Haha. I am so glad to have my cherry ChapStick back….actually it wasn’t lost, it was just missing. I didn’t know it. Good ol’ Carmex is still the best for windy days and putting on before bed. But, cherry ChapStick is best for days and dates…I mean,really, what guy wants to taste carmax. I didn’t think so. I’ve been wondering how literally one should translate dinosaur. haha….no, no…I know better. I really dislike wanting something with great intensity, it being right at my fingertips, and not being able to have it. I’m so stuck. I don’t know what to do. I suppose I actually DO know what to do. I sometimes just think having part of something is better than not having anything at all. At least I don’t have any allusions to the actual nature of the situation. I’m back in the gym, after a week hiatus. I missed the BURN!!!! lol. Gotta get these abs rockin’ again. I am very excited about going to the firing range soon. I’m just waiting on a firearm. But yay!! I plan on getting my carry permit around my birthday, and then get myself a pretty powerful birthday gift. 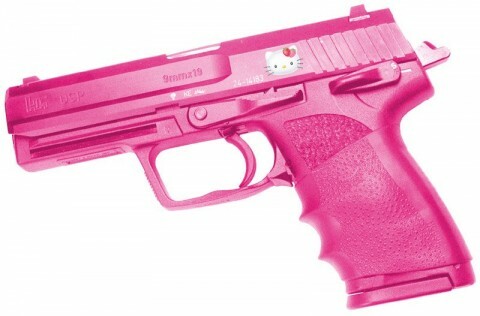 Like this pink hello kitty 9mm. Anyway….I’m excited and I hope to not be disappointed! I know I can do it! I am cleaning the apartment. Well, not at this very moment. Right now I’m blogging. But, I’ve been cleaning up and cleaning out my place. I’m trying to thin out and eliminate all this extra stuff…I have way too much “just stuff”. Also with the addition of my firearm, I now NEED a flashlight and a glowie necklace thingy . Thanks A Lot…I have been only moderately sucked into nifty glowy things that will consume funds. Shinies are still my favorite. I need to make an escape. I need a vacation. I just don’t want to go on an adventure by myself. I have an idea….but those often get turned down, and I’m tired of being turned down, so I won’t even ask again (even though I was told it sounded like fun last time I went). Anyway I hope everyone has a fantastic Thursday! Thanks for reading my rambling! Lot of things have changed. Some changes I’ve accepted. some I haven’t. I’m happy with myself….really, why shouldn’t I be happy with the person I am. I am bright, pretty, funny, adventurous, outgoing, caring, loving, and loyal. I would hope that people see and embrace these qualities that I like about myself, but I cannot make them. I know it’s really odd, but I’m okay right now with not knowing. Although I’d like some answers from different people, I’m more willing to just accept the things in life that come my way. When I think Vaseline, I think greasy, thick goop. This was far from the case with this lotion! I was looking for a good hydration lotion and was overwhelmed in the aisle at Wal-Mart. The commercials for the Vaseline Sheer Infusion is a little strange, but made perfect sense, if they did what was claimed. There are three different scents to choose from, I opted for the Botanical Blend. It has a light, warm but fresh, citrus scent. It goes on very smooth and absorbs quickly without leaving behind a tacky feeling. Absolutely not greasy and I instantly felt like my skin was much softer. Being cold and dry right now, I expected to re-apply pretty often. I put it on about 9pm and still feel very comfortable in my skin. I tend to have what my friend calls “plucked chicken bumps” on the back of my arms and thighs. These are much improved with two applications and I am hopeful that they will be resolved with further use. It made my skin feel like I have always expected body butter style lotions to, but fail. Scent: 9/10 Very pleasant, not over powering. This one is a little feminine, but one of the other options was pretty neutral. Price: 6/10 I purchased the 13.5 oz pump bottle for about 9 dollars. It was a much better deal than the 6.8oz without the pump for about 6 dollars. http://www.Target.com offers a $1 off coupon and http://www.vaselinesheerinfusion.com/ offers one for $1.50 off. Packaging: 6/10 Sleek, but not exceptionally eye-catching. Looks pretty much like any other lotion bottle. Texture: 10/10 I have to say this is the smoothest lotion I have ever used. It feels creamy, but not thick. Performance: 10/10 Feels rich going on, rubs in smoothly, absorbs quickly with lasting moisture. Do you have any experience with this lotion? Share it with us please!